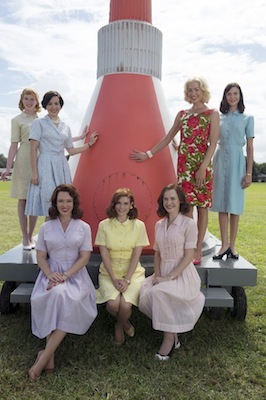 ABC has (finally) set a premiere date for its newest drama, THE ASTRONAUT WIVES CLUB. The series — based on the book with the same title by Lily Koppel — will bow Thursday, June 18th at 8 PM. The ABC series stars JoAnna Garcia Swisher, Yvonne Strahovski, Dominique McElligott, Odette Annable, Erin Cummings, Azure Parsons, Zoe Boyle as Jo Schirra, Desmond Harrington, Bret Harrison, Wilson Bethel, Kenneth Mitchell, Joel Johnstone, Sam Reid, and Aaron McCusker. Do you think you might be tuning in to THE ASTRONAUT WIVES CLUB? It seems DEXTER isn’t quite done with Hannah yet: a rep for the show confirms that Yvonne Strahovski (Hannah) will return for multiple episodes of the upcoming eighth season. EW was first to report the news. With DEXTER’s next season rumored to be its last (though nothing has officially been confirmed), it’ll be very interesting to see how Hannah works back into the show. After all, she a) was Dexter’s last love interest, b) knew his secret, c) was threatened by Deb, and d) a serial killer, too. Just a wild guess, but I’d imagine she won’t be back to walk into the sunset with Dex. Are you excited Strahovski will return to DEXTER?